This year’s Chinaplas series, held in Guangzhou from 20-23 May, had a 5% increase in visitors on the first day of the show, said officials from Hong Kong-based organiser Adsale Exhibition Services. The plastics show also saw a participation of 2,900 exhibitors from 38 countries occupying 220,000 sq m of floor space, with 15 national pavilions, thus making it the second largest plastics show in the world, after the triennial-held K show in Germany. Next year, Chinaplas will be held in Shanghai but already Adsale officials say that they envisage a shortage of space of 50,000 sq m. “We expect a higher participation in 2014 and even with the eight tents we built at the 2012 show to house extra exhibitors, there will not be enough space at the exhibition centre in Shanghai,” said Stanley Chu, Chairman of Adsale, at a press conference for journalists on the eve of the Guangzhou show. He also said that a solution is on hand with the building of a mega exhibition centre in Shanghai. “This will be ready by 2015, in time to host the 2016 show in Shanghai. But we will see first how the venue operations work, like the taxi services, catering and other support services,” said Chu. The new Hongqiao Convention and Exhibition Centre will be located near to Shanghai's main domestic airport in Hongqiao and will span an indoor exhibition space of 400,000 sq m, which is double the size of the Shanghai New International Expo Centre, where Chinaplas is currently staged. And with the annually-held Chinaplas growing at the rate that it is now, it may upstage the triennial-held K show, in terms of size, by 2016. But Chu conceded that size is not everything. 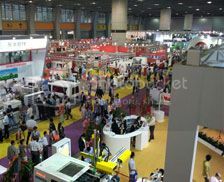 “Chinaplas will still lag behind the K in terms of quality of the exhibitors; technology and visitors. The K show is an event we will continue to benchmark against,” he said. Furthermore, the growing size of the show has resulted in insufficient time for visitors to visit the booths. Unlike the K show, which spans a period of 8 days, Chinaplas has traditionally run for three full days, ending at 3 pm on the fourth day. But this year was the first time that Chinaplas ran for a full four days. “The exhibition centre in Guangzhou is used by many other shows and we are unable to hold the show for five days, which is what exhibitors want,” explained Chu.